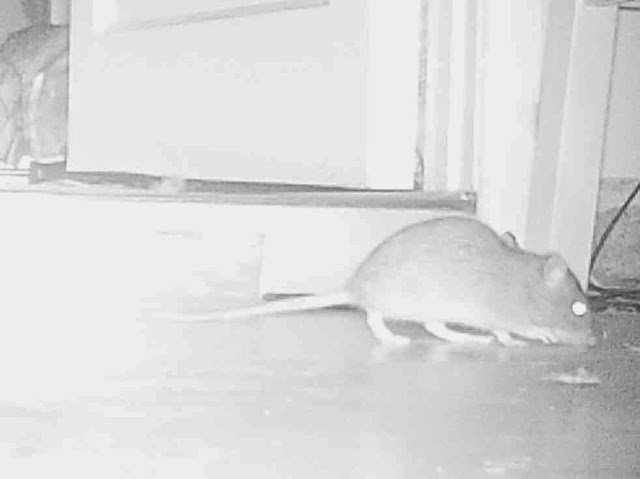 There's a rat in the kitchen, what am I gonna do? We borrowed our neighbour's trail camera to catch photographic evidence of the little blighters who've been keeping us awake at night. Most of the pictures were greatly over exposed because I'd set the camera too close to the hole where I thought they were coming in, but we did get a few clear images. That step behind him is three inches high, for scale. If we get a cat now, it had better be a battle-hardened bruiser. I'm certainly not getting a kitten (I wouldn't anyway, when there are so many cats needing homes) - I've read The Tale of Samuel Whiskers! I recently started helping out at the gardening club of the local primary school. It's a lovely little rural school with a lovely garden that includes, as well as raised beds for veg and a herb garden, a living willow structure for children to play in. This is a dome tall enough for an adult to stand up in, with two tunnel entrances, one of which is certainly NOT tall enough for an adult. 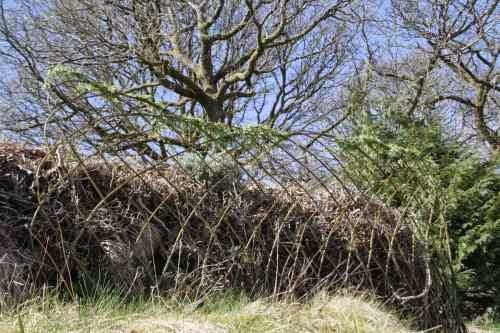 When I saw this structure just before Easter, it also wore a crown of shoots , about twelve feet tall. I commented on this to Charlotte, who runs the gardening club, and she said, Yes, that really needs attention. We'll probably have to get Sam in to deal with it. Noooooo! Sorry for taking your business, Sam, but I have my eye on that willow. I'll do it, I said. I spent a pleasant couple of half-days in the school garden, weaving in and cutting willow. That is, they started pleasantly enough, but were pretty tiring after a few hours, especially the first day, when I'd forgotten to put the time on my phone forwards by an hour, so stayed an hour longer than I thought I had. It's no wonder that Ian came to see what had happened to me. He then went back for the car, as my original plan of bringing the cuttings home by sack truck didn't seem all that realistic. 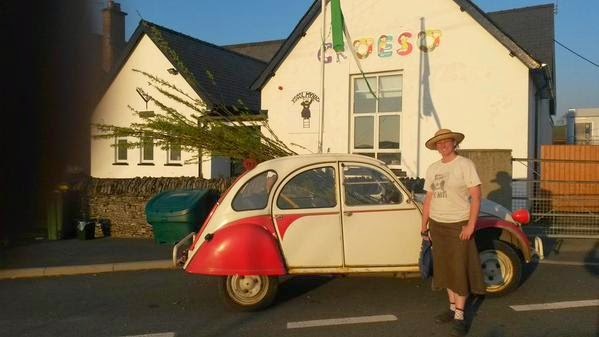 I had a couple of plans for the willow, but before I got round to starting on them I had an Idea. It was one of those ideas that's just too tempting to ignore, so everything else gets pushed back to make way for it. Can I make a bench out of willow? Yes, it seems that I can. Can I sit on it? Um, no, not as such... 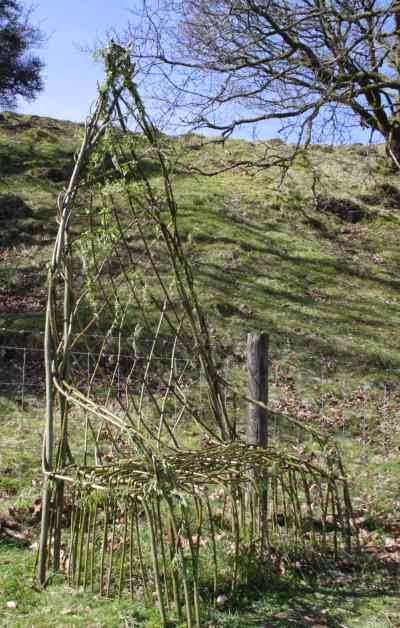 The idea is that all those willow twigs will take root, and as they grow they'll get stronger, and then we'll have a really cool living willow bench that we can actually sit on. Although willow takes root very easily, it really should have been planted about a month ago, before the leaves came out, so I'm not entirely confident that this will work, but I'm reasonably optimistic. In the meantime, I've moved the old bench a bit further along, so we can still use that. Once I'd made the bench, I turned to more mundane applications. I cut lengths of the sturdiest pieces to stick in a soft bit of ground below the driveway, where the roots should help reinforce the ground and prevent the driveway sliding into the stream when it floods. I should also be able to harvest lots of shoots from these, for either firewood (poor quality, but high volume) or basketry. The medium thickness shoots were used to make a fence around the terrace, to replace the one I planted originally, that subsequently died. I'll take more care with watering, this time. I still have the top pieces that I cut off the sturdiest shoots, which is just as well, because I'd forgotten another use I thought of a while ago. When we moved here there were two wooden arches over our garden path. One of them was old and rotten, and is no more. I'd like to replace that with a living willow arch. I don't think the pieces I have left are long enough to make an arch, so that will have to be a longer term project, but none the worse for that. In the meantime, I was quite glad of the rain yesterday, otherwise I'd have a lot of watering to do. Two nights in a row, we've been woken in the small hours of the morning by the sound of something falling to the floor in the kitchen. The first time, we couldn't find what had fallen. The second time, I went to investigate and found the small hammer, which had been sitting somewhat precariously on the edge of a shelf, on the floor. Precarious though it had been, it wouldn't have fallen off all by itself. 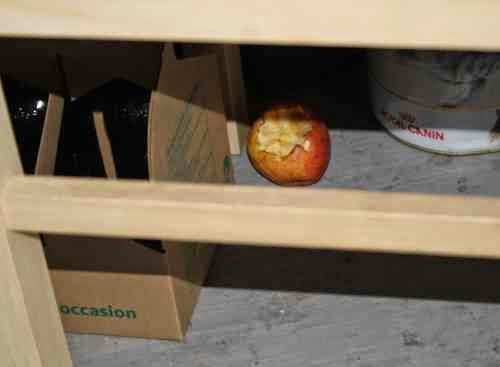 ... one chewed apple. That'll be what fell to the floor the first night, then. Ah, we don't keep all our food in cupboards - there is the fruit bowl, too, and it seems that at least one mouse has found it. I guess it knocked the hammer off whilst searching for more goodies. I think it's time we got another cat.